Roads nowadays have endless imperfections, so making sure your suspension is in tip-top condition is essential. If your suspension is working well, your journey when driving should be a smooth one, but if you feel every bump in the road, then it’s possible there’s something not quite right. If any of the following symptoms of a suspension problem seem familiar to you, be sure to acknowledge that something may not be right and get it fixed as soon as possible, as negligence could cause further problems. If you’re driving one day, and you find yourself wincing every time you go over a bump in the road, because it feels like your whole car is taking the impact, then you may have a fault in your suspension system. 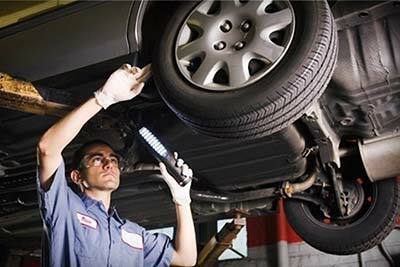 Specifically, your shock absorbers may be worn out. The role of your shock absorbers, also known as dampers, is to make sure your tyres stay in contact with the ground. 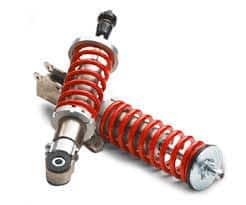 When you go over a bump, springs in the suspension have the job of taking all the kinetic energy from the car’s wheels, and then they transfer that energy to the shock absorbers, so that they can safely dispel the energy in an even way. This allows the car to remain steady instead of bouncing up and down each time it encounters a flaw in the road. One way to check if your shocks are damaged is to see if they are leaking fluid, if you see them and they look lubricated, it means that they are probably not working well and they need to be replaced. Uneven Tire Pressure – Driving your car with underinflated or overinflated tires can not only be the cause of your car pulling to the left or right, but can also result in uneven tire wear. Leaving this issue for an extended period of time could result in further problems, such as trouble with your wheel alignment. Poor Wheel Alignment – If you inspect your car and you find that the tread on your tires is more worn out in some places than others, then it is best to consider that your wheel alignment may have been disrupted. If you notice that you are driving straight but your steering wheel seems a little off-centre, then it is best to get your alignment checked out as soon as possible. Brake Caliper Keeps Sticking – Problems with your brakes is always depressing to hear about, but it is better to solve the problem sooner rather than later. If you notice that when you brake, the car pulls to one side, it could be due to the brake caliper getting stuck. This symptom may be easier to spot more than others, as on a normal basis, your steering wheel probably feels quite flexible, thus if handling becomes difficult, you know there is an underlying problem. Another issue is if you feel your steering wheel ‘slipping’ back and forth when you turn it. If poor wheel alignment is eliminated as a problem, then you may be looking at an issue in your Power Steering System, some problems including low power steering fluid, a loose or damaged power steering belt or a leaking power steering rack. If you park your car on even ground, and you notice that one corner rests lower than the other, this is another indication of a suspension system issue. A spring in the suspension has the duty of keeping the car balanced on each side, so when a spring gets damaged, it cannot hold the weight of the corner of the car properly, hence it sinking. Injury to the spring may cause an unusual clunking sound when driving over bumps, and turning corners may be difficult, as the damaged springs will have trouble holding the weight of the car. If you are suspicious that something is wrong with either your springs or shocks, carry out a simple test that will help you confirm whether you have a problem or not. Push down on the front or back of your car and observe how many bounces it does. If your car bounces more than three times, it is probable that there is a problem. When you stop your car and the car lurches forward and dips downward, this could be a sign of worn out shocks or struts, depending on which one your cars suspension system has. If this occurs, it’s important to get it checked right away, as it may not allow you to stop as effectively as you should be doing. A worn out suspension can cause your stop time to increase by approximately 20%. One thing you don’t want occurring when you turn a corner, is for your car to feel unstable. A damaged anti-roll bar may be the cause of that, as its role is to provide stability for the car against the force of a turn, but if you feel your car drifting around a corner, accompanied with some worrying knocking sounds, then it may not be doing its job and will need to be replaced. If you think that your car has any of these symptoms and that you may have a problem with your suspension system, get in touch today to find out how Sinspeed can help diagnose and rectify the faults quickly & efficiently. Tags : Suspension Damage, Suspension Faults, Suspension Issues, Suspension Maintenance, Suspension Problems.